Description of "The Aruna Sanskrit Grammar Reference, PDF (eBook)"
A PDF version of the author’s The Aruna Sanskrit Grammar Reference. The 7 inch by 6-3/4 inch PDF pages are formatted to best fit an 11-inch or more diagonal computer screen. Bookmarks are provided to quickly navigate anywhere within the book, making this an excellent substitute for, or addition to, the print version of the text. 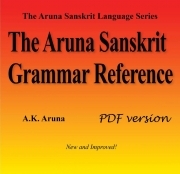 The first title in The Aruna Sanskrit Language Series is The Aruna Sanskrit Grammar Reference. The Grammar Reference follows the reference style presentation of grammar. This will provide a logical, consistent and complete exposition of the grammar for reading only proficiency. The grammar uses minimal wording and presents the material in outline and chart form as much as possible to maximize your visual memory of the information. This method also greatly assists review and re-review of the grammar, necessary to master the subject. Several of the charts have multiple forms within them that demonstrate simple, easy to remember patterns which are overlooked by many grammar books. This helps you to also logically remember the information. The grammar is presented in the Western style, which emphasizes analytic, reading skills, as opposed to the more difficult composition and speaking skills. As much as possible, the examples in the book are taken from the Bhagavad Gita, so your targeted vocabulary builds quickly. This reference book is an excellent book for those who already have a knowledge or familiarity with Sanskrit. It provides one source book to reference any question they have about the grammar of a word or a sentence. When combined with The Aruna Sanskrit Coursebook, they both provide a gateway to furthering a student’s knowledge in Sanskrit, and for beginners in Sanskrit who have some coaching assistance available. The Coursebook takes the complete second chapter of the Bhagavad Gita as its vocabulary and exercise material. These two texts together are meant for adults, rather than children. The material is presented for logically understanding Sanskrit, not for simply memorizing. Reviews of "The Aruna Sanskrit Grammar Reference, PDF (eBook)"